A110-1 BIRD FLOCKS WITHIN ARPT VCNTY - CHECK LCL ADZYS. A110-11 TWY A SOUTH OF TWY G RSTRD TO ACFT WITH WINGSPAN 225 FT AND SMALLER. A110-14 DO NOT MISTAKE TWY T FOR LNDG SFC. 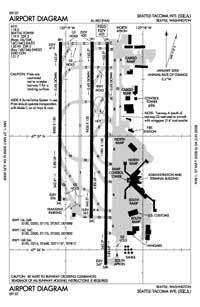 A110-15 ACCESS TO AIR CARGO 4 PARKING AND CARGO AREAS RSTD TO ACFT WITH WINGSPANS OF 170 FT OR LESS. A110-16 TWY FOR CORPORATE HANGAR RAMP LTD TO ACFT WITH 104 FT OR LESS WINGSPAN FOR TAXI OPS. GA CUSTOMS PARKING IS VERY LIMITED. A110-21 PPR FOR ALL GEN AVIATION PARKING AND SERVICES, CTC 206-433-5481. 6 HOUR PPR FOR AVGAS FUELING, CTC 206-433-5481. 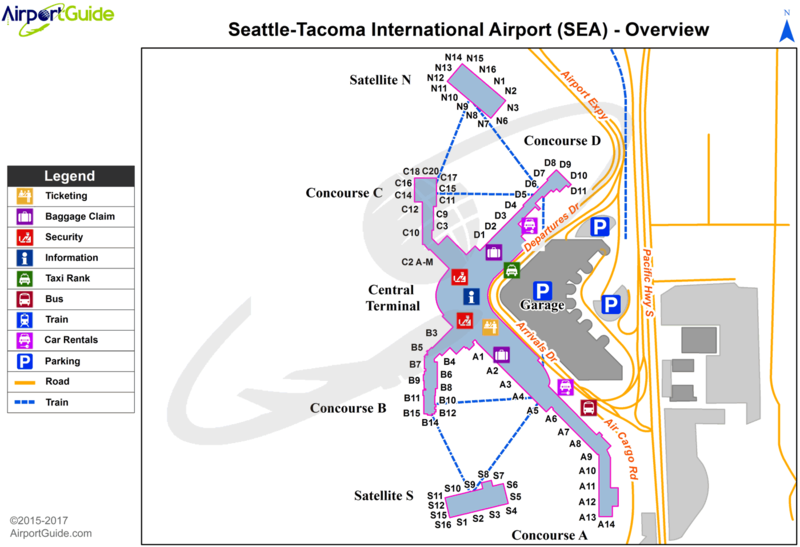 A110-22 TAXILANE W RSTRD TO WINGSPAN OF 135 FT OR LESS NORTH OF TWY N AND 167 FT OR LESS SOUTH TO TWX N . SEATTLE RAMP TWR PRVDS ADVSY CTL ONLY. A110-25 TAXILANE ON NORTH SIDE OF NORTH SATELLITE RESTRICTED TO WINGSPAN OF LESS THAN 118 FT. TRI-TAXILANES AT NORTH SATELLITE: CENTER (GREEN) TAXILANE RESTRICTED TO WINGSPAN OF 135 FT. OR LESS. WHEN AN AIRCRAFT IS ON THE CENTER (GREEN) OR OTHER (ORANGE/BLUE) TAXILANES, NO OTHER AIRCRAFT CAN SIMUL USE THE ADJACENT TAXILANE(S). ORANGE AND BLUE TAXILANES ARE RESTRICTED TO WINGSPANS LESS THAN 118 FT. TWO AIRCRAFT CAN SIMUL USE THE OUTER TAXILANES. A110-26 RY STATUS LGTS ARE IN OPN. A110-3 FLIGHT NOTIFICATION SERVICE (ADCUS) AVBL. A110-4 BTN THE HRS OF 2200-0700 THE USE OF EXTDD REVERSE THRUST IS DISCOURAGED BYD WHAT IS NECCESSARY FOR OPNL OR SAFETY REASONS. NOISE ABATEMENT PROCEDURES IN EFFECT BTN 2200-0600. FOR FURTHER INFO CONTACT SEA NOISE ABATEMENT OFFICE AT 206-787-7496. A110-8 HELICOPTERS LANDING & DEPARTING AVOID OVERFLYING FUEL FARM LCTD AT THE SE CORNER OF THE ARPT. A110-9 (E110) CONTINUOUS POWER ARPT. E111 EXISTED PRIOR TO MAY 15, 1959. Dual Wheel Landing Gear: 230. Dual Wheel Landing Gear: 216.